It was with great sadness that we recently said goodbye to respected colleague, mentor and friend, Rick White, who passed away on September 2, 2016. 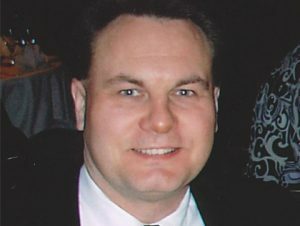 A two-time UBC alumnus, Rick received his Bachelor of Science with a major in Mathematics in 1990 and his Master of Science in Statistics in 1992. He began his career assisting Professor John Petkau as a consultant for the Statistical Consulting and Research Laboratory, eventually moving up to the role of Managing Director of what is now the Department’s Applied Statistics and Data Science Group. Rick was a true data scientist, long before the term became widely known. He provided statistical support and training to many, furthering the goals of researchers and administrators both within and outside the Statistics Department. He was an enthusiastic leader, known for his “weird and warped” sense of humour, his big heart and his generous nature. His statistical expertise helped many investigators use their data effectively, to reach their goals. His mentorship and training helped many students on their career paths. Rick is survived by Shannon, his wife of 17 years, with whom he shared his passion for history and geography through travel. He was also a music lover, a self-declared Rush super fan and an avid player of war board games. The Rick White Memorial Fund will commemorate Rick’s long-time contributions to the Statistics Department and his dedication to applied statistics, collaborative research and the profession of statistical consulting. Your donation to this fund will support a variety of activities, including stipends and workshops for students, conference travel, and special lectures. This is a most fitting way to pay tribute to Rick’s life and honour his leadership in bringing to the department a legacy of collaborative research and high level statistical consulting. The Statistics Department will match all gifts up to a total of $5,000, meaning your gift could mean double for our students.